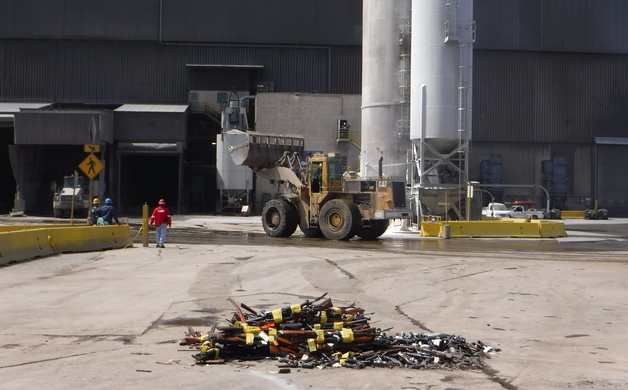 The Manhattan Beach Police Department sent 49 weapons to be destroyed during the Los Angeles County Sheriff's Department's 22nd annual Gun Melt Monday at the Gerdau Steel Mill in Rancho Cucamonga. The firearms MBPD sent included 15 rifles, eight shotguns, and 26 handguns/pistols, according to MBPD Officer Stephanie Martin. 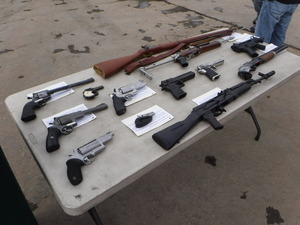 Martin said the firearms find their way into MBPD custody in a variety of ways: evidence of crime, confiscated/seized, and turned in voluntarily by family members (i.e. deceased parent owner) or surrendered by the owner, who no longer wants the weapon (i.e. adults with children in the home). MBPD Lieutenant Christian Eichenlaub joined Los Angeles County Sheriff Jim McDonnell and others at the mill for the weapon destruction. Weapons collected by 11 law enforcement agencies were destroyed so they can never be used for a crime again, said McDonnell.